Hey there! Today I’m guesting over at the Simon Says Stamp blog for their STAMPtember® celebration! So happy to be joining in the fun! I’m sharing two cards there that both use the new Hero Arts Lisa’s Painted Maple leaf stamp since I thought it would be perfect for fall. Here’s a bit of backstory — I drew the leaf and watercolored it on a rainy vacation day at a cabin in Mont-Tremblant, Quebec. 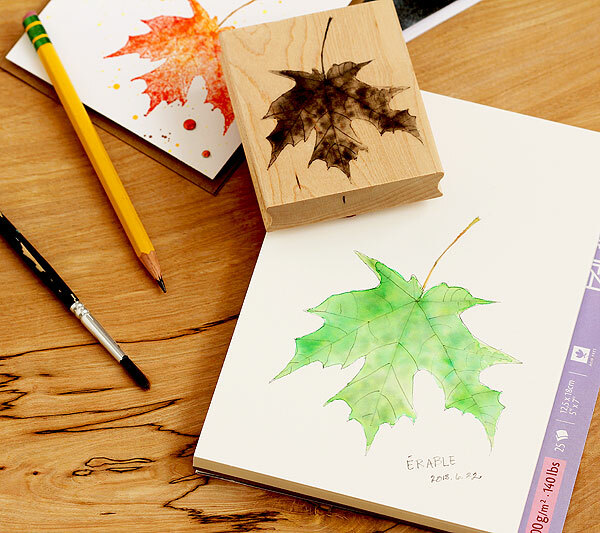 It was so peaceful and relaxing as I sat with a real maple leaf and sketched it — but I never dreamed that it would become a stamp one day! It was so crazy cool stamping it, the stamp captured all of the little details that I added. You can see a peek of the cards that I’m sharing in the upper left side of the picture — I was imagining how the leaf would look if I watercolored it this time of year instead of back in June. 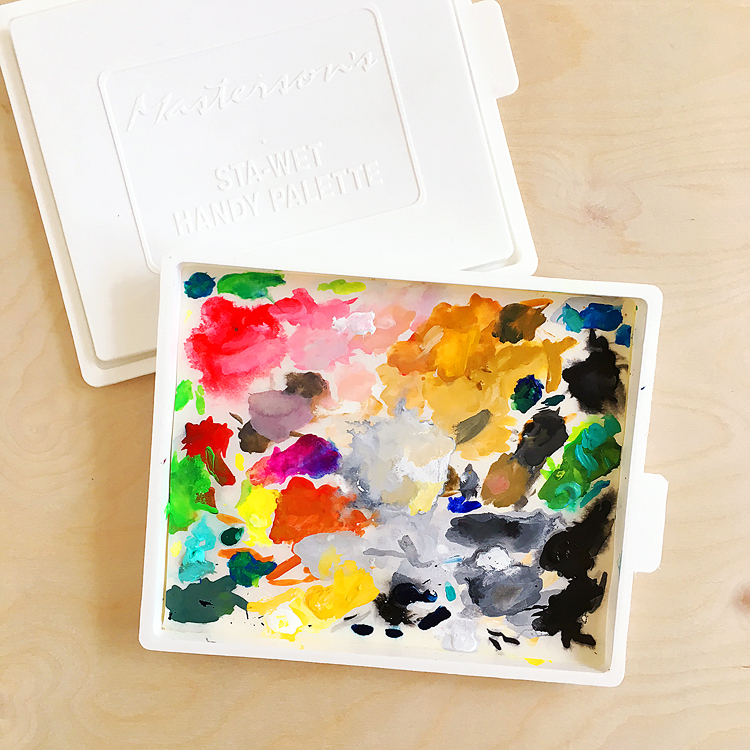 So if you haven’t seen the cards yet, click on over to Simon Says Stamp and check them out — then come back for the a coupon code that gives you 15% off ALL Hero Arts products! and is good for 15% off ALL Hero Arts, now through September 27th! I thought I’d share a few more stamps that I did for Hero, along with some of my favorites from the 2013 Holiday Catalog! First up, Lisa’s Pen and Ink Fir. It’s a sketch of a balsam fir that I drew the same day as the maple leaf. When I drew it, the tips of the boughs were bright lime green — such a contrast with the evergreen color of the rest of the plant, no? I have big plans for this stamp, can’t wait to have more time to use it. Here’s a quick card that I did for the Hero blog last week. And that’s not all — I also did some greetings and a set of parenthesis to go with them! I thought these would go great with the chalkboard trend that’s so in right now! I did them while at a hotel in Montreal. So crazy having stamps with my writing on them — I’m still can’t believe it! BTW, if you haven’t seen it yet, I did a video on how to use the awesome Chalkboard Background stamp right here. Now then, to help ya with your shopping I put together a list of just a few of my faves from the Hero Arts 2013 Holiday Catalog. I could have listed more — LOTS more, ha ha! 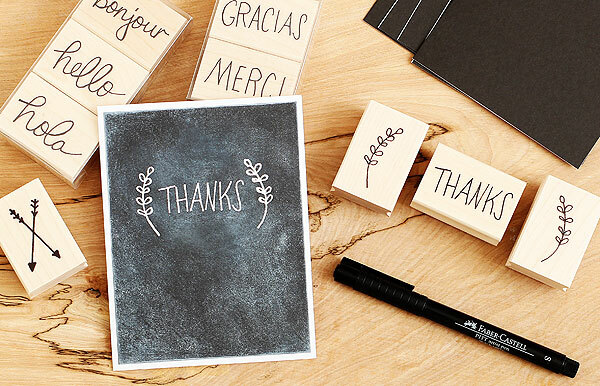 The Hero Arts black notecards shown in the first row are white inside, so you can make a chalkboard background and still stamp or write a message on the inside — so handy! They’re also great for Halloween, too. I’ve also listed some of my fave inks, including new neon red! And I added some of the metallic decor that Hero has — these are like enamel dots, only shiny. Love! 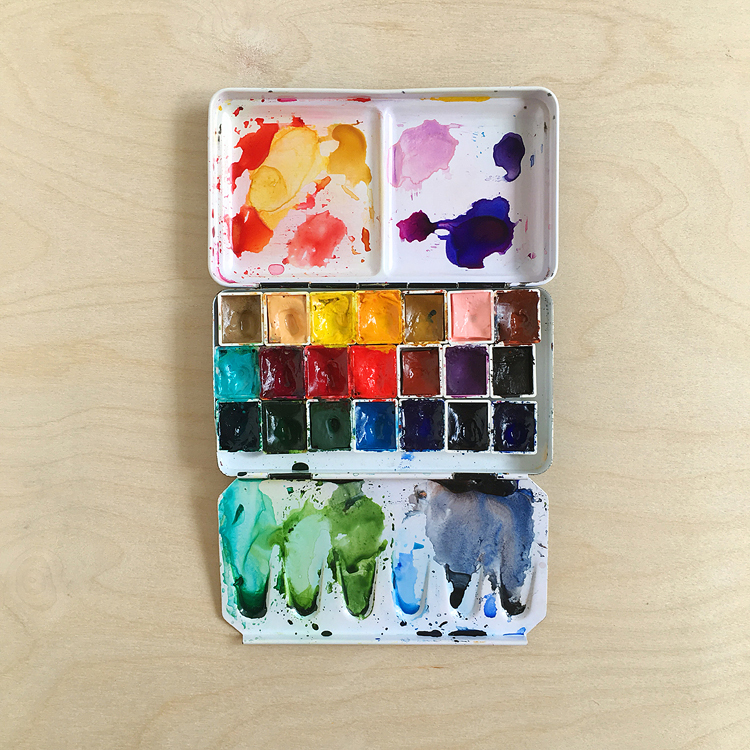 Video: my card design process w/Studio Calico kits! Your cards are just FAB! I luvvvv the Canadian Maple Leaf stamp! I am Canadian and I so appreciate the story behind it. Thanks so much. Lisa! I love seeing your name on stamps. Yay. I remember the day that you shared with us when you drew this leaf. Such a progression of talent! Love, love, love (and coming from someone who is not a fan of fall…….). You rock, sweet gal! Awesome, Lisa! I’ll bet ya have to pinch yourself every time ya see your own name on those stamps! Too cool! No matter what color you use on that fabulous leaf stamp, it looks soooo real! These are all wonderful. I especially like the leaf card. 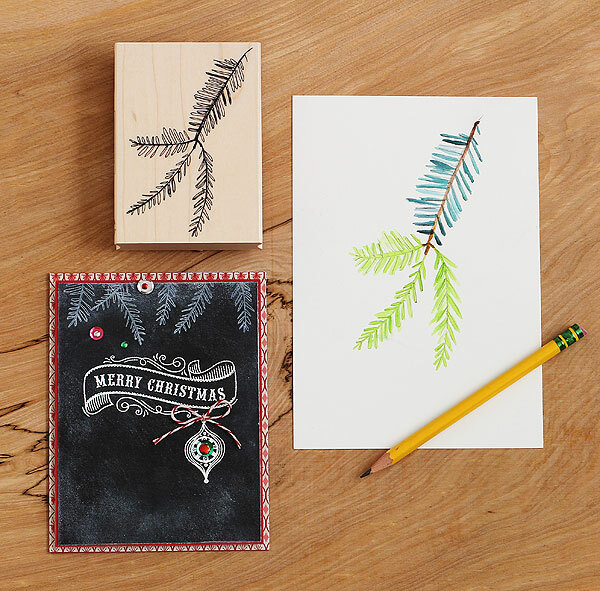 I LOVE that Leaf stamp Lisa! It’s one of my top Favorites from HA.